You didn’t include any information about your budget so I decided to make some recommendations for some value priced Android smartphones. One of the hottest buys in value priced smartphones in 2017 is the Motolora G Plus. This phone is the 5t editon of Motorola’s G series and offers incredible value. It is a 5.2inch phone and using Android 7, Google’s latest. This phone will work with all four major networks, AT&T, Verizon, T-Mobile or Sprint so it is a great choice. The 32 GB Storage + 2 GB RAM model is available on Amazon for $230 and the 64 GB Storage + 4 GB RAM costs $300. You can pick up this phone on Amazon or at BestBuy. Another great choice would be the BLU R1 Plus. This phone is compatible with the AT&T or T-Mobile networks in USA. This phone currently sells for $160 on Amazon and is also available from Best Buy. You may also want to consider BLU LIFE ONE X2 for $180 or BLU Life ONE X2 Mini for $160. Like the R1 Plus both these phones are compatible with the AT&T or T-Mobile network in the US. The BLU Life phones have a fingerprint sensor for unlocking the phones. You can find many reviews of all these phones online and on YouTube for more information. The BLU R1 PLUS is also available at Best Buy. One thing I wanted to note was that it seems you asked me for a recommendation for a phone that will work with the Tracfone AT&T standard or micro SIM because you have the DUAL SIM card. Rather than choose your phone by the SIM you have, I’d say pick the best network for you whether that is the AT&T or Verizon network. After pick your phone and the get the SIM that network and the correct size. 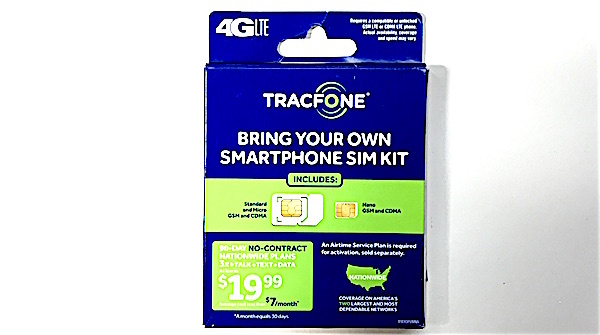 Tracfone SIM kits cost a $1 and come with Standard,Micro, and Nano SIM cards for both their AT&T and Verizon networks.